What's wrong with my plant? In this section we will share the most common diseases in the vegetable garden in the warm months. If your tomatoes have had diseases in the past, ANR Publication 8159, "Growing Tomatoes in the Home Garden" (PDF) includes a list of selected tomato varieties and their resistance to diseases. When all of the leaves on one branch or stem wilt and turn yellow or brown, it often means that a plant is affected by vascular wilt. 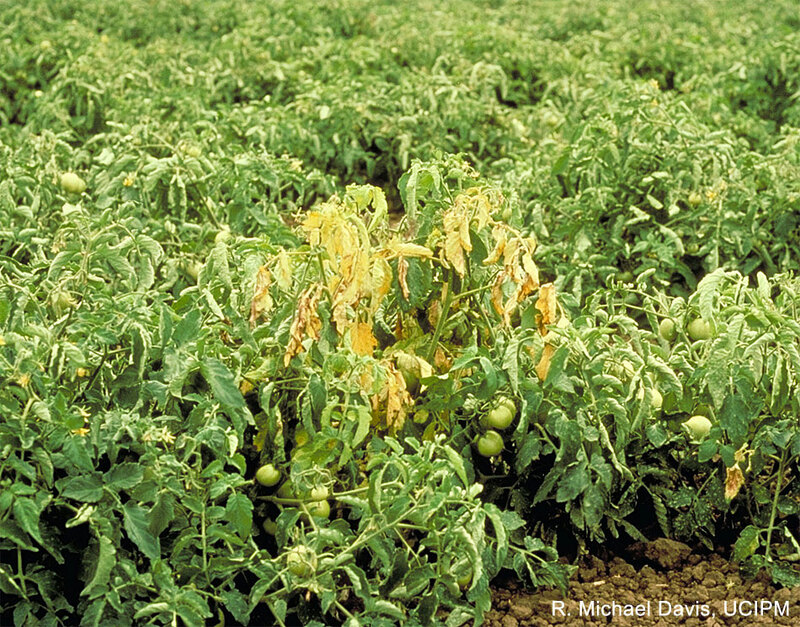 In tomatoes, vascular wilts are caused primarily by soil fungi Fusarium and Verticillium. 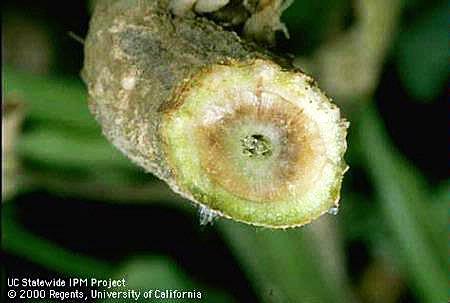 Both Fusarium and Verticillium fungi plug up the vascular system and restrict water flow to the foliage, thereby causing wilting. Wilt symptoms are generally similar, and it is extremely difficult to distinguish the two diseases in the field. A laboratory analysis by a plant pathologist is usually required to confirm the diagnosis. Both wilts have the same management solutions. Plant turns yellow, starting with one side or branch and gradually spreading throughout the plant (photo above). Plant wilts and eventually dies. Cross-sections of stem show dark reddish brown discoloration (photo below). Caused by a soil fungus that affects tomatoes only; favored by warm soil. Older leaves begin to yellow and eventually die. Yellowing begins between main veins of leaves. Internal stem is very slightly tan colored, usually in small patches (photo below). Caused by a soil fungus that infects many different plants. Favored by cool soil and temperatures, but symptoms are most severe when plants are stressed for water in hot weather and when they have a fruit load. Wilt resistant seeds and plants of many tomato varieties are available. Look for the letters “V” and “F” next to the variety name. “V” indicates Verticillium resistance, and “F” or “FF” indicates Fusarium resistance. Soil solarization can effectively reduce the amount of these wilts in the soil. Additionally, follow good sanitation practices (wash equipment to prevent movement of infested soil; remove all residue, including roots, which may be susceptible). Rotate crops and avoid planting tomatoes where tomatoes, potatoes, peppers, or eggplant previously grew. It is always a good idea to check your plants for diseases when they are removed at the end of the season. Cut the trunk or lower stems and look at the cross sections to see if there is discoloration as depicted in the photos above. Fruit from plants with Fusarium or Verticillium wilts may exhibit symptoms of sunscald due to reduced leaf cover. As a result, fruit may not taste the very best, but they pose no health risk. Avoid eating fruit with obvious mold on them. How to Manage Pests in Gardens and Landscapes: Fusarium Wilt and Verticillium Wilt of Tomatoes - UC IPM Online, UC Statewide Integrated Pest Management Program – Vegetables. California Department of Food and Agriculture, Plant Health and Pest Prevention Services, Plant Pest Diagnostics Lab. If your tomato plants are growing poorly with reduced fruit yield, and if the foliage yellows and turns brown from the bottom up and the plant looks wilted, root knot nematodes may be the culprit. Nematodes are microscopic, eel-like roundworms. The most troublesome species in the garden are those that live and feed within plant roots most of their lives and those that live freely in the soil and feed on plant roots. Although California has many different species of root-feeding nematodes, the most damaging ones to gardens are the root knot nematodes. They attack a wide range of plants, including many common vegetables, fruit trees, and ornamentals. 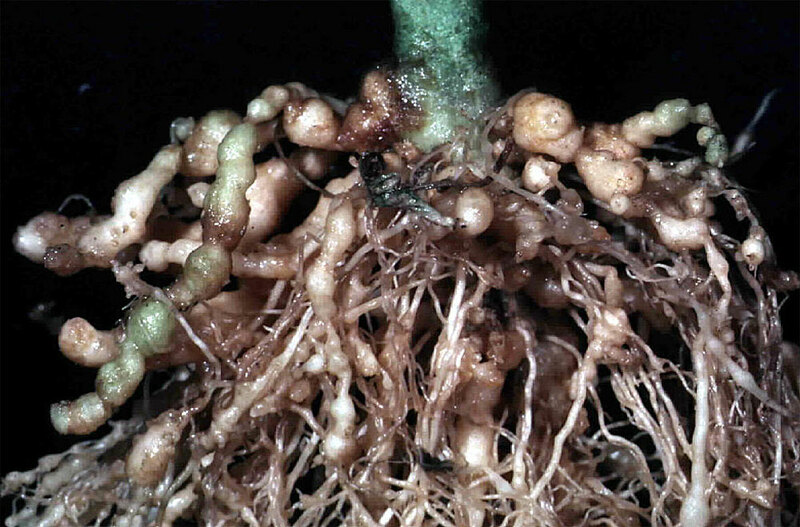 Root knot nematodes usually cause distinctive swellings, called galls, on the roots of affected plants. Infestations of these nematodes are fairly easy to recognize. Dig up a few plants with symptoms, wash or gently tap the soil from the roots, and examine the roots for galls. The nematodes feed and develop within the galls. Nematodes are difficult to control, and they can spread easily from garden to garden in soil on tools and shoes or on infested plants. The most reliable practices are preventive, including sanitation and choice of plant varieties. You can reduce existing infestations through fallowing (leaving unplanted for one season), crop rotation, and soil solarization. However, these methods reduce nematodes primarily in the top foot or so of the soil, so they are effective only for about a year. Provide optimal conditions for plant growth including sufficient irrigation and soil amendments to make plants more tolerant to nematode infestation. Also pull up and dispose of roots immediately after harvest. One of the best ways to manage nematodes is to use tomato varieties that are resistant to nematode injury. Tomato varieties that are resistant to common root knot nematode species have an N following the tomato cultivar name on the seed packet or label (for example: VFN indicates resistance to Verticillium, Fusarium, and Nematodes). Although even resistant tomato varieties can still exhibit some root galling under high nematode levels, they usually maintain their yield. Pest Note - Nematodes, UC IPM Online, Statewide Integrated Pest Management Program - Publication 7489. Sometimes the tomatoes that we lovingly tend exhibit strange circular spots on the skin. 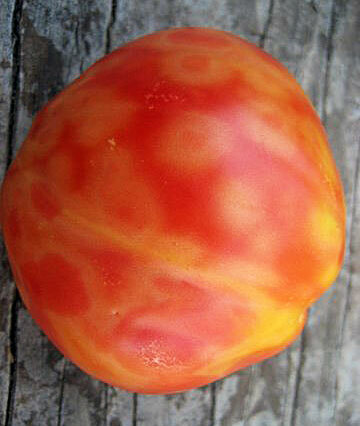 If any of your tomatoes look like this photo, your tomato plant may be infected with tomato spotted wilt virus. Infected plants exhibit bronzing of the upper sides of young leaves, which later develop distinct, dark brown spots (the result of the tissue dying). Leaves may be cupped downward. Some tip dieback may occur. On ripe fruit, yellow spots and blotches appear, often with concentric rings; sometimes fruit has distorted bumps. This virus can also occur on pepper plants. It is common to have only some of the fruit showing symptoms, while other fruit appear fine. The timing of infection can cause the variation of symptoms. Later infections in the plant growth stage are less damaging. Symptoms on the fruit and on the foliage vary widely. 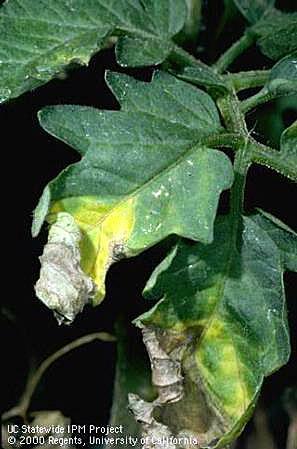 The tomato spotted wilt virus is transmitted by thrips, tiny, slender insects with fringed wings. They feed by puncturing the outer layer of leaves and sucking out the cell contents, which results in stippling, discolored flecking, or silvering of the leaf surface. Thrips feeding is usually accompanied by black varnish-like flecks of excrement. Control thrips with applications of insecticidal soap. Removing and destroying infected plants can help control the spread of the virus. Is the fruit edible? According to the California Department of Food and Agriculture Plant Pest Diagnostics Lab, so far there is no evidence that any plant virus is capable of infecting humans; however, the fruit may not taste the best. Gene Miyao, Yolo County Farm Advisor, Vegetable Crops. 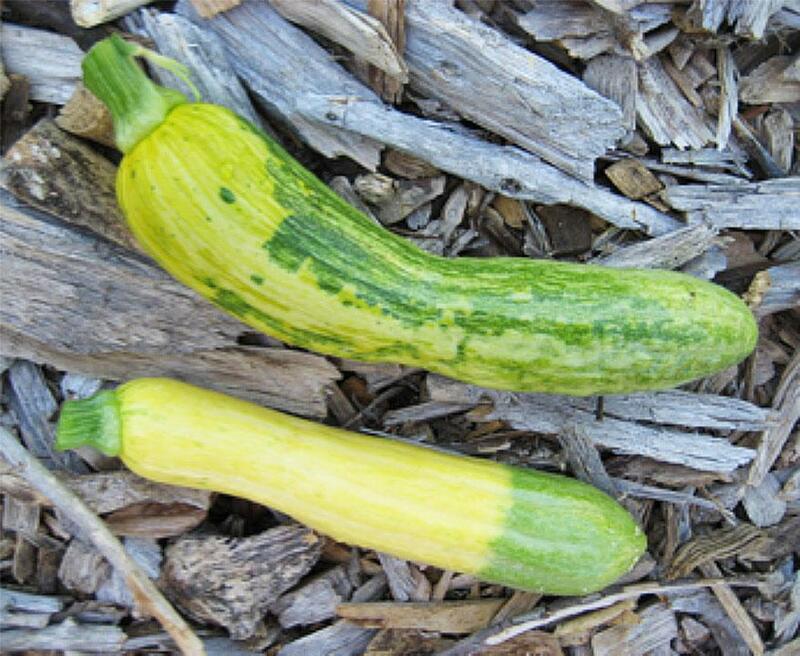 The first photo shows an excellent example of watermelon mosaic virus, a common virus among cucurbits (squash, pumpkins, melons, and cucumbers). A positive diagnosis cannot be made without having the plant tested at a lab. This variety ('Zephyr' hybrid summer squash) was positively identified as having that virus (testing was done at the California Department of Food and Agriculture Plant Pest Diagnostics Lab). Watermelon mosaic virus is transmitted by aphids. Fruit symptoms can range from subtle color change to severe deformation. The virus is exhibited on the squash fruit in the photo as color breaks: the normal solid yellow color and light green blossom end are now splashed with green and can even turn completely green. Symptoms on the foliage of squash can be mild, with leaves looking mottled (light and dark spots that are irregularly shaped). Most viruses attacking cucurbits have a wide host range, which includes carrot, lettuce, tomato, beans, peppers, and several weed species. Transmission to cucurbits from other host plants requires contact with plant sap. The most common means of spread is through feeding by insects that have fed on the sap of infected plants. Many species of aphids transmit mosaic virus, and cucumber beetles vector squash mosaic virus. 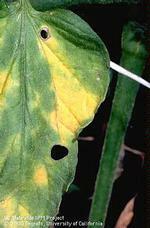 Viruses are transmitted by insects, such as aphids, whiteflies, and cucumber beetles. Remove infected plants as soon as they are detected. It is not practical to try to control virus diseases by using insecticides to control insects. Using reflective mulches such as aluminum foil may reduce or delay infections as it helps repel insects from plants. Covering young plants with floating row covers (for example, Agribon) can also protect them from insects; however, the covers must be removed when plants begin to flower so bees can pollinate the flowers. Do not compost infected plant material. Instead, send it to the landfill. University of Minnesota Extension, Commercial Fruit and Vegetable Production. Two species of fungi can cause powdery mildew on cucurbits (squash, melon, and cucumber): Sphaerotheca fuliginea and Erysiphe cichoracearum. S. fuliginea is the more common. E. cichoracearum can, however, be common in areas with cool springs and summers. 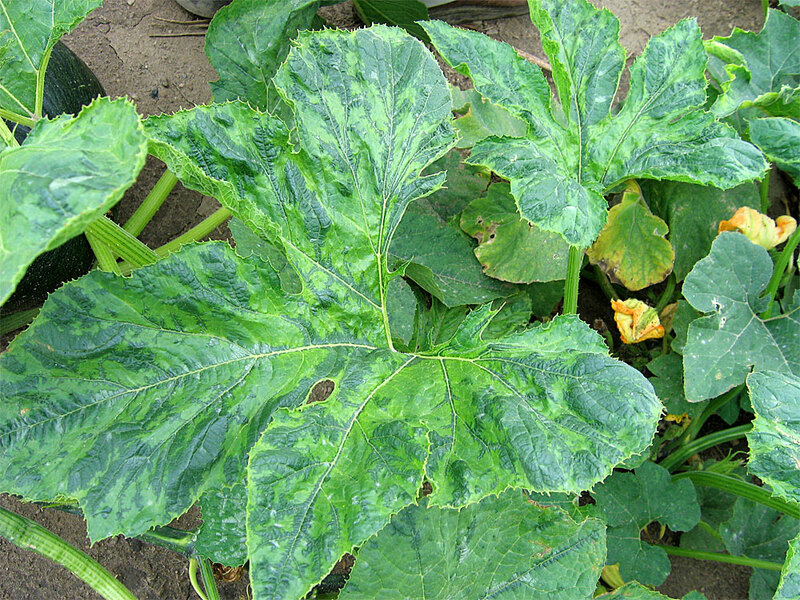 All cucurbits are susceptible to powdery mildew, but the disease is less common on watermelon than on other cucurbits. 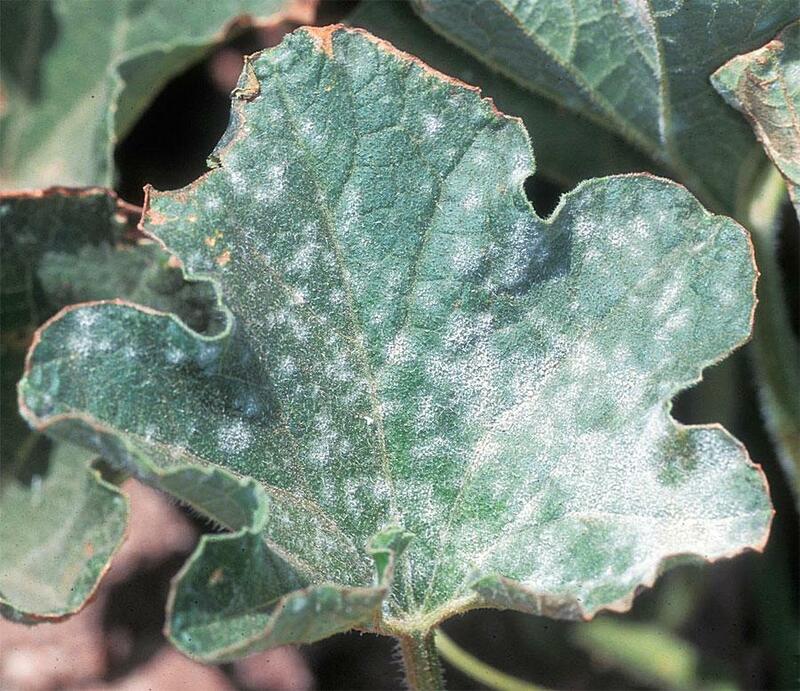 Powdery mildew first appears as pale yellow spots on stems, petioles, and leaves. These spots enlarge as the white, fluffy mycelium grows over plant surfaces and produces spores, which give the lesions a powdery appearance. Affected leaves become dull, chlorotic, and may wilt in the afternoon heat; eventually they become brown and papery. Plants may die. 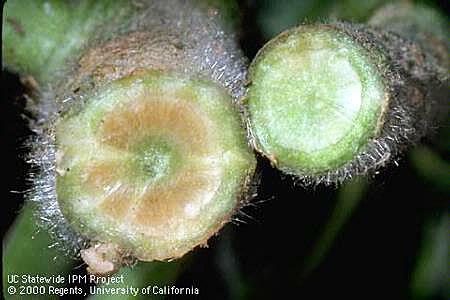 All powdery mildew fungi require living plant tissue to grow. Most powdery mildew fungi grow as thin layers of mycelium on the surface of the affected plant part. Spores, which are the primary means of dispersal, make up the bulk of the powdery growth and are produced in chains that can be seen with a hand lens. Spores are carried by the wind to new hosts. All powdery mildew species can germinate and infect in the absence of water. Moderate temperatures and shady conditions are generally the most favorable for development. Spores are sensitive to extreme heat and direct sunlight. The best method of control is prevention. Planting resistant vegetable varieties when available, or avoiding the most susceptible varieties, planting in the full sun, and following good cultural practices will adequately control powdery mildew in many cases. Control weeds and follow good sanitation practices. Avoid overhead sprinklers. Applications of sulfur may be needed. Good coverage of undersides of leaves are required. Note that some cucurbit varieties are sensitive to sulfur.